Global warming is clearly the biggest threat to Earth in modern times. This essay will discuss the reasons behind global warming and suggest probable solutions. The major factors causing the warming of the earth are the excessive release of CO2 gas and deforestation. CO2 is a greenhouse gas that damages the ozone layer and is emitted from various sources, such as vehicular emissions or burning of fossil fuels in power plants. These sources emit thousands of tons of harmful gases into the biosphere each year. The vehicular emission rates are also drastically rising due to high demand for personal vehicles. This results in increased worldwide consumption of fuel and transportation. Lastly, forests house large reserves of carbon in various forms. Deforestation is causing even larger amounts of carbon dioxide to be released into the surroundings thereby causing the greenhouse effect. However, there are potential approaches to take care of these issues or minimize the impacts. Firstly, governments need to reduce reliance upon petroleum products and advance in terms of alternative fuel choices. Additionally, people can create a positive influence by making changes in their lifestyle. Individuals can attempt to purchase vehicles with the best fuel efficiency, and possibly utilize their vehicle when extremely necessary while relying heavily on public transport. They can bring about a shift from the usage of non-renewable energy sources to alternative power sources. Lastly, little things like purchasing energy-efficient products, switching off unused devices around us and planting more trees also help a lot. To conclude, global warming is a serious issue, and such steps should be taken by governments and individuals to reduce their effects. If this threat needs to be eliminated, this cause should become a priority for everyone. 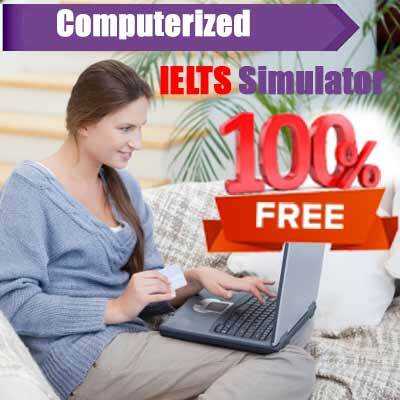 Nowadays many people have access to computers on a regular basis and a large number of children play computer games. 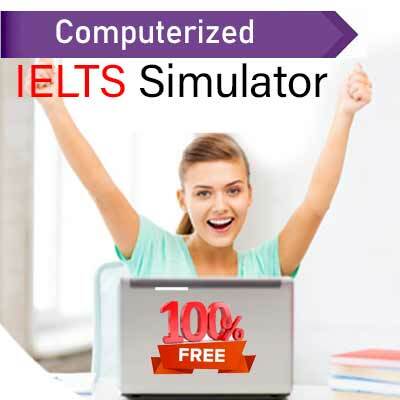 What are the positive and negative impacts of playing computer games and what can be done to minimize the bad effects? Technology and its reach in human life have significantly increased over the past few years. This has had a lot of implications, including a dramatic increase in the number of children playing computer games. This essay will examine various impacts of this change and discuss possibilities to avoid any negative effects. Talking about the positive aspects, playing computer games has numerous benefits. These can range from helping children develop cognitive skills to increase their logical reasoning. Games have developed into a whole industry. These have allowed children to test their abstract and logical thinking skills. Many of these games require children to follow various commands and try to solve complex problems with the use of logic. Such games are surely advantageous for a child’s mental progress. On the other hand, people are raising concerns over the prolific use of violence and sanguinary elements that these games contain. These may be highly addictive, in the sense that they reward the players for being more violent, thereby setting a wrong example. Apart from being addictive, they contribute to arresting a child’s social development and lead to the inculcation of aggressive feelings of anger and hate in their thoughts and habits. However, there are many steps that can be taken to minimize negative impacts. Firstly, video games are rated for different ages and parents can choose them for the children in order to avoid unsuitable content. Secondly, parents can limit the duration of playing games for the children to keep addiction at bay. Finally, parents should take an active interest in the children’s activities and encourage them to play outdoor games. To sum it up, video games have a lot of advantages along with an array of disadvantages. Parents should supervise their children and take precautions to avoid any negative effects these might have on children. The chart above shows information about various professions in the U.K. and their salaries. The table shows the average working hours per week for each profession. Summarize the information by selecting and reporting the main features, and make comparisons wherever relevant. 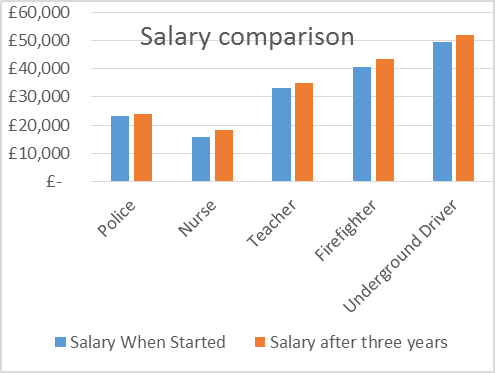 The bar graph shows the salaries of various professions when they started, compared with their salaries after three years. The adjoining table also contains data for the average working hours for each profession per week. It can be deciphered that the salaries after three years have increased for each profession. However, the underground train driver got the maximum increment of 2500 Pounds, and the policeman got the least increment of 600 Pounds. The nurse got the least salary amounting to only approximate 15,700 Pounds, whereas the underground train driver got just under 50,000 Pounds which was the highest amount of salary in comparison. On the other hand, the teacher and the policeman get slightly more than 23,000 Pounds and 33,000 Pounds respectively. Comparing this data to the working hours per week, it is found that the underground train driver is being paid the most amount of money per hour and nurse being paid the least. In contrast, the teacher and firefighter have 55 working hours which are the highest. Moreover, the nurse and the underground train driver have 38 and 36 working hours respectively, which are the lowest. To sum up, even after three years and a substantial raise of salary for each profession, the trend does not change and the tube driver was still topping the chart and the nurse on the last position.